Do traditional, volume based accounting systems hide important costs such as cost of compliance with regulations? 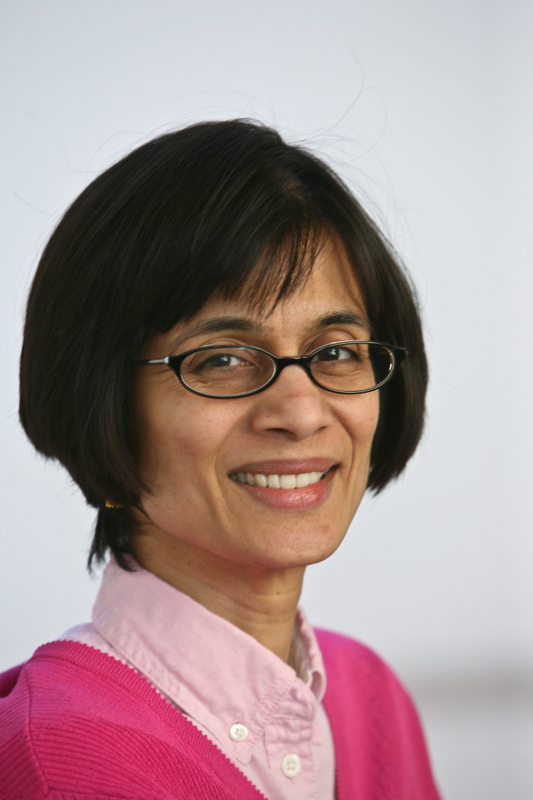 Using an example of environmental costs in the steel industry, Professors Satish Joshi and Ranjani Krishnan explore the extent to which the costs of regulatory compliance are “visible”, i.e., reported explicitly by firms’ accounting system, and “hidden”, i.e., obscured under other cost categories. Econometric analysis suggests the presence of substantial hidden costs, which at the margin, are 8-10 times the reported visible costs. The results underscore the importance of investments in more detailed costing systems that capture various types of hidden costs. The primary functions of a cost system include estimation of the costs of objects such as, activities, products, processes, services and customers. The information generated by a firm’s costing system is used to support product and service decisions, enable cost control and performance evaluation and support external financial reporting to investors, regulators, and other interested parties. In order to improve the quality of information generated by costing systems, various cost system refinements such as Activity Based Costing (ABC) have been suggested. An ABC system uses multiple cost drivers to trace the costs of activities to products and thereby improves the accuracy of cost estimates (Cooper and Kaplan, 1999). Important cost drivers that have been identified by extant research include production volume, manufacturing transactions, product mix heterogeneity and complexity of operations. In industries subject to relatively stringent environmental regulations, such as steel, chemicals, utilities and paper, regulatory compliance is an additional factor which drives costs. Environmental regulations can have a major effect on firms’ costs and performance. Firms incur the direct costs of complying with various environmental regulations such as installation and operation of waste-water treatment facilities, flue gas desulfurizers and other “end-of-pipe” pollution control equipment. Such emission control requires additional inputs of capital, labour, material and energy and increase the cost of the manufactured output. Costs associated with installation and operation of these pollution-control equipment are easily identifiable as environmental costs and most accounting systems accumulate these into environmental cost pools, separate from other cost pools. ‘Visible’ environmental costs are such easily identifiable and separable costs of regulation. In addition to the visible costs, regulations also impose other constraints on the firm’s production technology. That is, apart from installing and operating pollution abatement equipment, environmental compliance often requires additional adjustments in the production processes and optimal input combinations, which further affect the total cost of the manufactured output. For example, in response to more stringent regulation of the iron-ore sintering process most steel mills substituted iron ore pellets for sintered ore. Similarly, coke oven emission regulations lead to partial substitution of coke by natural gas or pulverised coal. Many mills lowered combustion temperatures or replaced coal with natural gas in their boilers and furnaces in response to air quality regulations. Because typical accounting systems are not set up to separate out the incremental raw material costs due to switching to pellets as an environmental cost, these regulatory costs may be ‘hidden’ within material costs. Similarly incremental costs associated with changing the fuel mix may be hidden in energy or factory overhead cost pools. Such hidden costs, if substantial, can result in severe distortions in costing systems. In order to efficiently manage the costs of regulation and incorporate these costs effectively in decision making, it is important for firms’ accounting systems to first identify these costs. Recognition of the importance of environmental regulation as a cost driver and accurate estimation of the effect of regulation on costs is essential for effective cost and profit management. We examine the effect of environmental regulations on product cost in the steel industry, which is usually subject to stringent environmental regulations throughout the world. We examine the following two issues. One, to what extent does environmental regulation drive total costs in the steel industry? Second, how much of the costs of regulation are hidden under other (non-regulatory) cost pools? We use data from the US steel industry. Production of steel is highly polluting; therefore the steel industry has been subject to considerable environmental regulatory pressures. However, the reported costs of environmental compliance in steel firms’ accounting systems are often small – for example, the environmental costs in the US steel industry as reported in the Pollution Abatement and Control Expenditure (PACE) surveys conducted by US Bureau of Census comprised less than 5 percent of the total costs of steel making, although the industry vociferously complained about high costs of regulations. This suggests that the reported costs did not reflect the true impact of regulations on cost. Using unique, confidential, plant-level data from the Bureau of Census for a total of 55 US steel mills, we examine the effects of environmental regulation on steel production costs for both integrated mills, which produce steel from iron ore, and mini-mills, which produce steel by melting steel scrap in electric arc furnaces (EAF). We then estimate the hidden costs of environmental regulation using a multivariate system of equations with multiple cost drivers including production volume, technical change, input prices and regulation. Our results indicate that environmental regulation is a major driver of product costs. We also find that visible costs as reported by the accounting system identify only a minor proportion of the overall costs of regulatory compliance and that the hidden costs of environmental regulations are 8-10 times the reported visible costs. Thus, consideration of only the visible costs of environmental regulation leads to serious under-estimation of the impact of regulation on cost and profit. Our findings have major implications for design of costing systems in firms which face significant environmental regulations such as steel, chemicals, paper and oil refineries. Given the multi-product nature of most of these industries, incomplete identification and allocation of environmental costs leads to problems such as, under or overpricing of products and inappropriate product-mix decisions (Cooper, 1987). In the long run, omission of important cost drivers (such as environmental costs), will not only lead to less accurate decisions related to the management of these costs but also distort other control systems such as flexible budgeting systems, variance analysis, performance measurement and responsibility accounting systems (Banker and Johnston, 1993). Consider steel production cost (C) as a function of output volume and prices of inputs such as material, labour, energy, capital, time and regulatory stringency. The cost function used is a standard restricted cost function of the following form: C = C(Y, Pi, R, T); where Y represents output of the firm, Pi’s are exogenously determined prices of input factors such as capital, labour, energy and materials. R represents environmental regulatory restriction, T is a time trend variable representing technological progress. We employ a translog cost function (Christensen et al., 1973). We use the reported (visible) environmental operating expenditures/unit output as a measure of environmental regulatory restriction, R.
The estimated elasticity of total costs with respect to changes in regulatory restriction (which is provided by the partial derivative ∂ lnC/∂ lnR of the cost function described earlier) helps us to uncover the magnitude of hidden costs. If there are no hidden effects of environmental regulations, a one unit increase in the reported environmental costs should increase the total costs by one unit. If there are hidden costs which are not captured by the reported environmental costs, then the increase in total costs would be larger than the increase in reported environmental expenditure in total product costs. The estimated elasticity would hence reveal the extent of hidden costs and the leverage that the reported environmental costs have in driving overall costs. Plant level data on output, input prices, input quantities, and the regulatory expenditure were extracted from Census of Manufacturers (CM), Annual Survey of Manufacturers (ASM), MECS (Manufacturing Energy Consumption Survey) and PACE surveys available at the US Bureau of Census. Econometric analysis indicates substantial hidden costs (see Joshi, Krishnan and Lave, 2001 for further details). Consider an integrated mill with an average production cost of $360 per short ton (ShT) with reported environmental operating costs of $12/ShT. Estimated elasticity of regulation indicates that any increase in regulatory stringency causing a $1 increase in reported or “visible” environmental operating expenditures will increase the total cost by $9.23 dollars at the margin. However, $8.23 of the incremental cost of regulatory compliance would be hidden under other accounts such as materials, labour, and overhead. 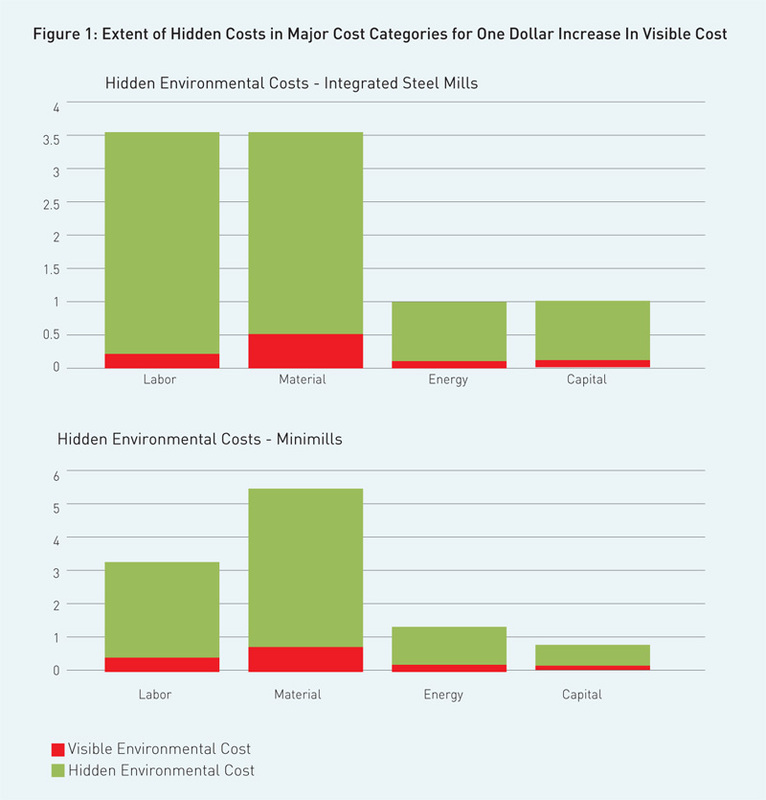 Similarly, for a mini-mill with an average production cost of $340/ShT and reported environmental operating expenditures of $9/ShT, a $1 increase in the visible portion of environmental regulation costs is estimated to increase total cost by $10.68, of which $9.68 will be in the form of hidden costs accumulated under other accounts. Thus, the hidden costs of environmental regulation are much greater than the visible costs. Additional decomposition analysis helps to estimate the extent of hidden costs in different cost pools. For the integrated mill sector, an increase in regulatory stringency resulting in a $1/ShT increase in reported regulatory costs causes an increase in labour cost by $3.62/ShT, of which only $0.29 is visible in the form of an increase in regulatory labour costs. The remaining $3.33/ShT is hidden in other labour cost pools. Similarly total materials cost increases by $3.56/ShT, of which $0.55 is in the form of visible environmental material costs and the remaining $3.01/ShT is hidden in other material accounts. The extent of hidden costs for energy and capital are $0.95/ShT and $0.94/ShT respectively, although visible costs are only $0.08/ShT each (Figure 1). For the mini-mill sector, an increase in reported regulatory cost of $1/ShT (consisting of $0.30 labour, $0.52 material, $0.12 energy and $0.06 capital cost) will increase the overall production cost by $10.68/ShT of which $9.68 are hidden in in other accounts which can be decomposed into $2.96 in labour costs, $5.01 in material costs, $1.16 in energy costs and $0.55 in capital costs. These results indicate that the hidden costs and consequent cost mis-estimations are high, which raises the question, why do managers make no attempts to estimate and include hidden costs in the reported costs? At face value it would seem that firms have a strong motivation to include lots of costs into the “regulatory costs” category if for no other reason, then simply to add weight to their claims that they are being over-regulated and to influence future regulatory processes. We can conjecture several reasons for not estimating the hidden costs. One, managers may not be aware of the magnitude of these hidden costs. Two, managers feel that these costs are anyway captured under other cost categories and hence there is no misrepresentation of the overall cost of production. Third, the focus of managers could be on the management of aggregate costs of the type that are reported in financial statements, rather than the actual economic cost of operations. As a consequence, less attention may be paid to developing appropriate accounting systems to properly track and quantify hidden costs. It is also possible that managers feel that the cost of collecting and disaggregating detailed data on all regulatory costs exceeds the benefits from such activity. However, the benefits of such data collection critically depend on the extent of hidden costs. If the hidden costs of regulation are relatively small, such behaviour might be justified. This paper presents a method to help managers of regulated firms to make such a judgment. More recently similar methods have been used to estimate hidden costs of food safety regulations in the sea food industry and the results indicate a significant underestimation of reported food Hazard Analysis and Critical Control Point (HACCP) costs by $1.10 for a dollar of reported expenditure (Ragasa, Thornsbury and Joshi, 2011). These results suggest that investing in more detailed costing systems that capture various types of hidden costs may be justified in heavily regulated industries which make complex production adjustments to remain compliant. Extent of Hidden Costs in Major Cost Categories for One Dollar Increase In Visible Cost. Banker, R D and H Johnston (1993). “An Empirical Study of Cost Drivers in the US Airline Industry”. The Accounting Review. 68 (3): 576-601. Christensen, L R, D W Jorgenson and L Lau (1973). “Transcedental Logarithemic Production Frontiers”, Review of Economics and Statistics. 55 (February): 28-45.
Cooper, R (1987). “Does Your Company Need a New Cost System?” Journal of Cost Management.1: 45-49.
Cooper, R and R S Kaplan (1999). The Design of Cost Management Systems, 2nd Edition. New Jersey: Prentice Hall. Joshi, S, R Krishnan and L Lave (2001). “Estimating the Hidden Costs of Environmental Regulations”, The Accounting Review. 76(2): 171-198. Ragasa, C, S D Thornsbury and S Joshi (2011). “Are Food Safety System Costs Misestimated?” Journal of Agricultural Economics. 62(3): 669-689. Associate Professor in the Department of Agricultural, Food, and Resource Economics, Michigan State University. 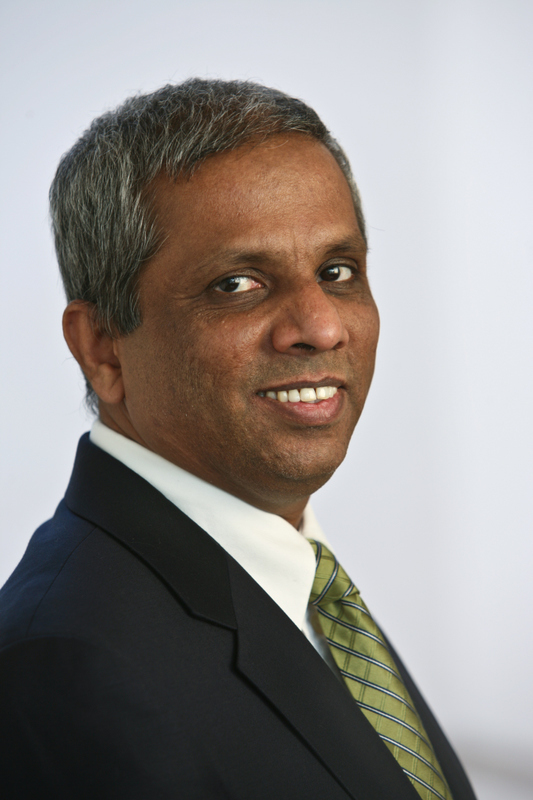 Professor of Accounting and Information Systems and Plante & Moran Faculty Fellow at the Eli Broad Graduate School of Management, Michigan State University.